It is just about to be my oldest daughters 16th birthday and she is growing into an amazing young woman. For this birthday I had planned to build her a chest. My wife's parents all gave their girls (four of them) hope chests when they hit their teen years as a place to collect the things they would eventually need when they moved out and started lives of their own. My intention was to build her a carved, 17th century joined chest, but life is great at complicating itself and our housing situation is still up in the air. It didn't seem fair to give her a birthday present I would have to put right into storage. So I cast around for a few days for an idea or two and eventually fixed on the right thing. She does a lot of sewing, making stuffed monsters and puppets of all kinds and she brought some of her sewing stuff with to our temporary living arrangements. I spied her sewing stash the other day, sitting in a neat pile by the dinning room table, and I realized I could build her something that would both help her store her kit and be something flexible that could last her whole life. 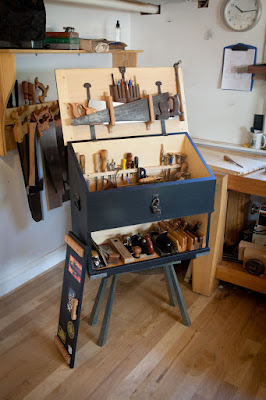 I thought of the school box from the book "The Joiner and Cabinet Maker" from Chris Schwarz at Lost Art Press. A few seconds later I thought of the stash of curly red oak I picked up a short while ago. I wanted to use that special stuff for projects for my wife and girls anyway and there isn't enough for four big projects. Four smaller projects will be good As long as I can get things done right and not screw them up completely. Starting with this one. The boards are pretty rough and took a bit of clean up. I sorted through the stock to find one that was just wide enough for the sides of the box. Then I set about marking and breaking down the sides. I planed the boards flat and sized them identical. As I made the final wispy sweep of the smoothing plane I marveled at the figure I had exposed. I have never worked with stock like this before. I have always gone for straight grained, workman like stock. This curly red oak is a bit of a diva to work with. Demanding, exacting, and a little unforgiving, but sharp steel conquers all. Once planed down smooth the stock was thicker than I would have picked. It weighs in at just under an inch thick. I don't have the means to resaw a board wider than six inches, and I didn't like the idea of ripping the boards, just to resaw them and reglue them or plane them down to a thinner nutrisystem version and leave a ton of that highly figured and beautiful wood on the shop floor. There was no real debate over the decision. The box is built from thick and sturdy stock that will ensure it holds up to years of use and abuse. Dovetailing the box is another assurance of it's longevity. Bombproof construction for a lifetime and then some. I took the chance to put my new Knew Concepts fretsaw to work. There's not a much better test than inch thick red oak. The saw worked well, I'm going to try a couple other different blades and uses before I pass judgment on whether I prefer it over my old coping saw. I like to change up the sizes of my dovetails in a project like this. Aesthetically I like a little chunkier dovetail and if you space those out evenly they can easily be mistaken for the template and router cut variety. I space them out both to make it visually interesting and to set my joinery apart. The other day someone asked me why I bother to cut them by hand. My answer was simple, because I like to and because I can. What other reason do you need. As the box started to come together I got the pleasure of watching the joinery come out tight and the grain and figure of the wood wrap itself around the box. I couldn't help but smile. In "The Joiner and Cabinet Maker" there are two characters. There is Thomas, the good apprentice who works hard and is able to turn out good work, and then there's Sam. He's the "bad" apprentice who leaves his tools dull and scattered about and turns in shotty work. I can relate to both of these guys on any given day, though I try very hard to be more Thomas than Sam. So far on this box my inner Thomas seems to be winning out, and that feels good, but I have to keep vigilant, a few minutes of the careless Sam can ruin a project. Just say no to Sam. Looking good! That is some very pretty lumber. I'll warn you that on a schoolbox I made of figured maple, the wood movement happened pretty quickly and the lock moved enough to cause some problems. If you use the locks from Horton, you can file the edges of the hooks to be rounded or ramp-like so that they can be nudged a bit more. I was thinking about skipping the lock. I made one of my semi annual trips to the Woodcraft in Madison this past week and I stood and stared at the half mortise locks for a while trying to decide what I wanted to do. In the end I cam home without one. Sam is always somewhere in the shop. Him and his dull tools. And the menacing way he looks at Sally. 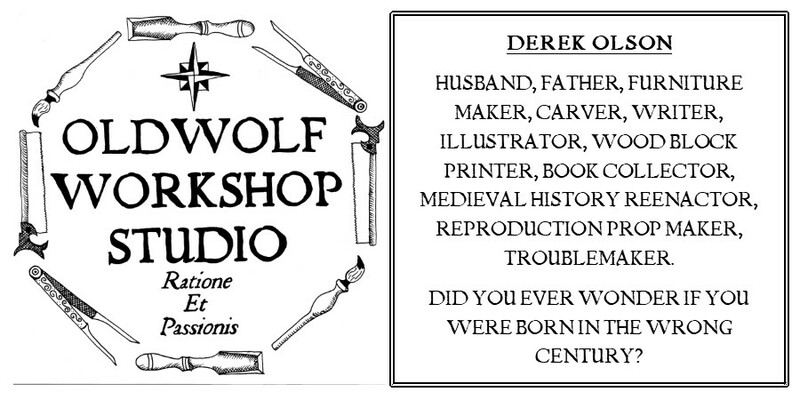 Looks good Derek. That curly oak is some pretty stuff. Should really pop when you apply a finish. Hardware How I Want It. No Good Solutions. . .